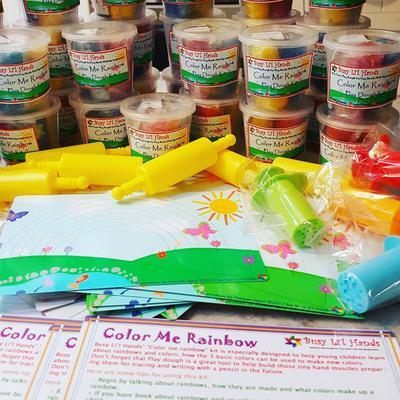 Busy Li'l Hands is a venture that debuted with its fruity smelling homemade play dough, made with all edible ingredients meant to be ‘Non toxic Play Dough for tiny Hands with Big Imaginations’. A. My Children! They are the force that keeps me motivated and passionate about life, self-discovery and growth. I am in constant competition with myself; I set the bar myself and keep raising it higher. As a mother of two girls, I choose to be proactive in their social, emotional and educational upbringing. I want to raise them to believe that they have the power to make their world a better place. My drive comes from the desire to give my children an endless supply of hope that they could someday share with the rest of the world. A. We began this venture as a mum and daughter pilot project mid-2015, at the time we only marketed to friends and family. Alhamdulillah it was a great learning and humbling experience for our entire family. 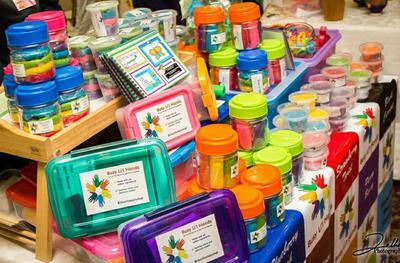 Busy Li'l Hands officially debuted, at the Karachi International Book Fair in the Winter of 2015, with its signature fruity smelling homemade play dough, made with all edible ingredients. Our tagline says it all, ‘Non toxic Play Dough for tiny Hands with Big Imaginations’. At the time we had no idea how to move forward and our introduction to the Crafter’s Guild in February 2016 sealed our fate as permanent members of the local crafting community, which has become our second home. 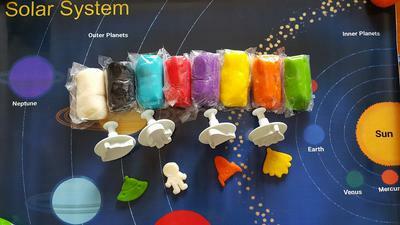 I would initially make the play dough myself and my daughters helped in the sorting, packaging, and labelling process. Now we have hired a team that helps us with the production and packaging. My daughters also happen to be the creative designers at Busy Li’l Hands; they have designed and illustrated most of the images used in our play dough mats and booklets. We have been home-schooling for almost 7 years now and play dough has been an integral part of our learning process; using it for crafting, learning, playing, experimenting, etc. We have used it to create landscapes for geography, 3D models for geometry, and erupting volcanoes in science, mixing colours for physics, and of course have created a masterpiece or two along the way. I had been “play dough” since my kids were little and would get requests from friends and family to make play dough for them. A. I am a hard-core Pakistani at heart. My vision is to see a Pakistan that is proud of its heritage, culture, Arts, crafts and talent; an educated and Socio- Economically stable Pakistan. 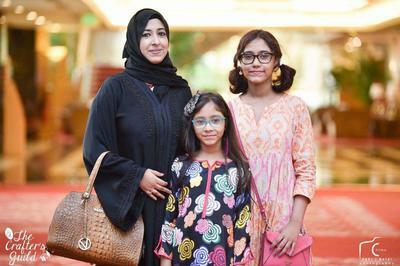 There are very little, if any, resources for young kids available that connect them with Pakistan in a fun and engaging way. I wanted to create educational and recreational material for children that would also give them a deep appreciation of the country that they live in and the treasures that it enfolds. Our ‘Amazing Pakistan Play Dough Mat’ is the first of its kind. It is colourful, attractive and very informative. We are in the process of developing more educational material and kits for children of all ages. 1. To help reconnect the element of “fun” with the educational and learning processes of young children. Because we believe that a happy learner is a learner for life. 2. To motivate parents to spend more time playing with their toddlers. Children are more receptive to learning when their experience is positive and they feel loved and secure. Play is the best way to connect with children. And research says that play is also the most effective learning tool. What I love most about my work is the love and support I have received and continue to receive from a number of amazing and brave women. The increase in the level of confidence that I see in my daughters makes it all worthwhile. “Mama! You are my role model. You are the strongest person I know”. I may have been broken and down with self-doubt, but these words gave me the strength to continue. To tread down this path with my daughters right by my side; together we have come this far - together we will move mountains! A. In line with our vision to “make learning fun” we have added some supporting educational and inspirational material to our list of products to facilitate parents and teachers in reconnecting the element of fun to the learning process. We have developed play dough booklets for developing fine motor skills from 18 months and above. In addition to these we also have play dough booklets for learning counting/numeracy, alphabets/sounds, vocabulary and formation of letters, shapes etc. We plan on introducing a new concept of hands on play dough story time and/or rhyme time for little kids. Many young kids need multiple sensory experiences in order to be fully involved in an activity and our play dough and mats will add to the overall experience of storytelling and singing rhymes. A. Allah is the best of providers and sustainers! No one can take from you, what has been ordained for you and vice versa. Live each day to the fullest; be gracious and grateful. Be humble and considerate. Every “perceived” failure is another block to strengthen the foundation of your success. Never compare yourself to anyone but yourself. Strive to be a better version of “You” every day of your life! Spend time with people that motivate you to achieve your dreams and are happy to celebrate all your little triumphs.